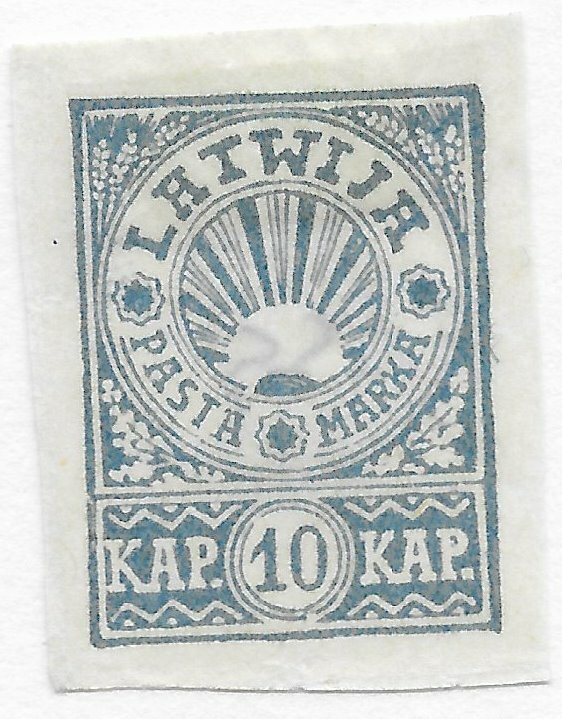 In his latest blog, Dr David Parker introduces the stamps that chart Latvia's long road to independence in 1918. Latvia travelled a tortuous and bloodstained road to independence. Under Russian occupation since 1721, a nineteenth century national revival led to conflict with the Baltic German aristocracy as well as resentment at the policy of Russification ordered by Tsar Alexander III. In 1905 Latvians were prominent in the abortive Russian revolution although their hostility targeted the Baltic Germans as much as the Russians. In the ensuing campaign of brutal retaliation the Baltic Germans and Cossacks executed several thousand Latvians, and many more were exiled or fled. In summer 1915 Russia implemented a scorched earth programme as the German army advanced. Thousands of Latvians trudged to Russia, leaving burning houses and farms, and empty and wrecked factories behind them. The Germans captured Jelgava, the capital of Courland, but failed to secure the key cities of Riga or Daugavpils. Thousands joined the Volunteer Latvian Rifle units and served alongside the Russian army. The Germans were held along the Daugava River until the Russian army finally disintegrated in mid 1917 and opened the way for the Germans to occupy Riga. Under the relatively liberal rule of Kerensky’s Government various centrist Latvian politicians meeting in Valka in Latvia’s relatively safe far north established a Provisional National Council which the following month proclaimed itself the sole authority for all ethnic Latvian lands. At the same time, though, the Bolshevik inspired Iskolat government, also in Valka, denied the National Council possessed any authority. However when Lenin’s fragile rule seemed to buckle under German onslaught’s, on 30 January 1918 the National Council declared that Latvia comprised the four regions of Courland, Semigallia, Livonia and Latgale, and would become an independent democratic republic. In March 1918 the Treaty of Brest-Litovsk ceded Latvian Courland and southern Livonia to Germany, and here, as in Estonia, many Baltic Germans sought the creation of the United Baltic Duchy under the German Emperor. By then, though, the region had been devastated, and even greater suffering was on the way. After the Armistice the numerous Latvian political parties outside the Bolsheviks reached agreement and on 17 November the new People’s Council formally proclaimed independence and created the Latvian Provisional Government. In violent opposition the Latvian Bolsheviks proclaimed Latvia was part of the Russian SFSR, and on 1 December a Soviet army, strengthened by numerous Latvian Volunteer Riflemen, advanced from Pskov and Daugavpils. The Red Army entered Riga on 3 January 1919, and a Latvian SFSR was proclaimed under Peteris Stucka who immediately ordered land confiscations and the execution of all those considered class enemies – notably German nobles, capitalists and priests. Thousands died in the chaos and terror. The Provisional Government’s control was reduced to a region around Liepaja. It had issued its first stamps on 18 December. 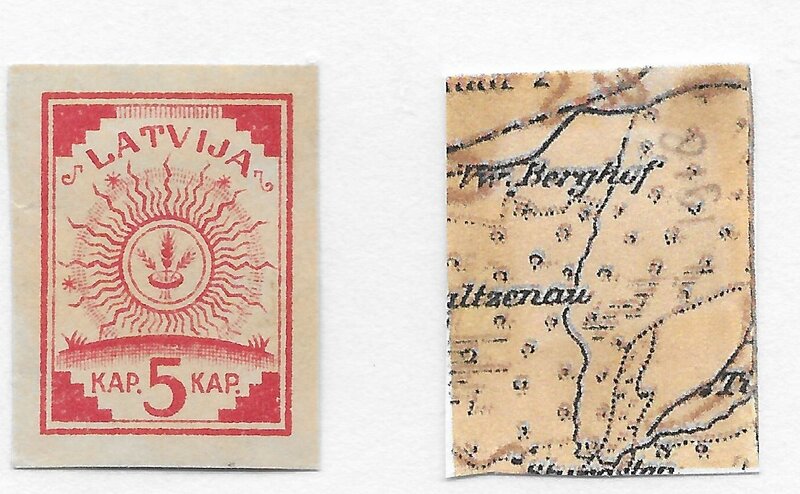 Printed on the back of surplus German military maps the first was a 5 kapeikas value featuring the sun enclosing ears of corn. While enduring the Red Army’s onslaught and gathering strength for a counter-offensive the same design was extended to many more values printed on a variety of papers with different perforation sizes. In cooperation with the German Freikorps, the Provisional Government’s army belatedly but successfully fought back. 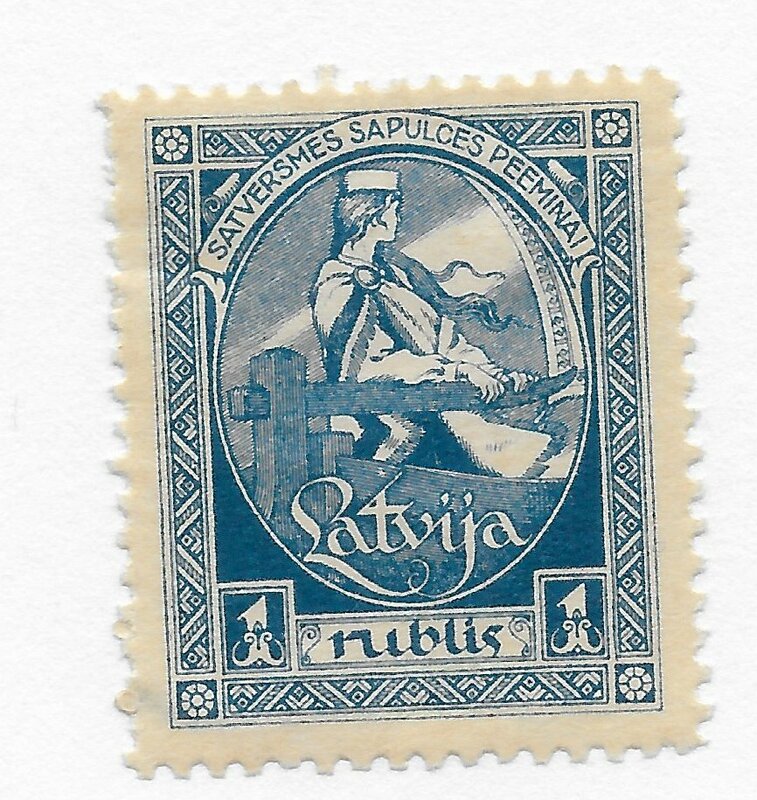 The Freikorps recaptured Riga in May 1919 and the event was marked by a set of three stamps featuring two women clutching each other by a skull lying amidst briars with Riga’s profile in the background. The earlier Red terror was duly matched by the Freikorps own White terror against all Bolshevik sympathisers. The post-war ambition of Germany to reclaim Baltic territory led to disagreements and eventual military conflict between the Freikorps and the Provisional Government. After defeat by Latvia and under international pressure, on 23 June 1919 the Germans agreed to leave but many were assimilated into Colonel Avalov-Bermondt’s White West Russian Army that was also striving to conquer the region, but primarily to keep it Russian. The disruption this caused to communications led to the Estonian commander in Livonia hastily printing new 10k stamps for northern Latvia when supplies of normal issues failed to get through. 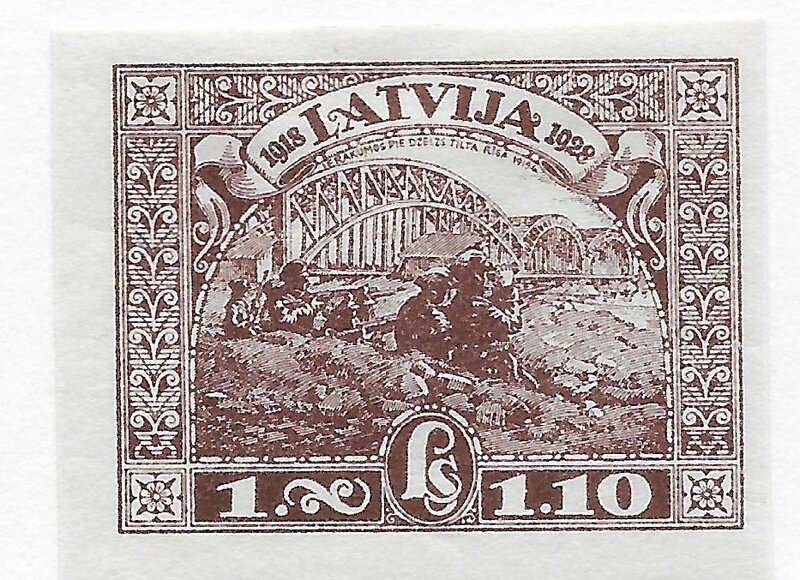 They incorporated a new design of a rising sun that was later reflected in the Latvian coat of arms definitive issue introduced in October 1921 and often reprinted. On 5 October 1919 the West Russian Army seized the west bank of the Daugava River and part of Riga itself but by the end of November Latvian and Polish forces had driven it from the city (with the help of British warships) and then the country. Despite the Red and White armies lingering presence, on various dates from 18 November 1919 a striking set commemorated the first anniversary of independence. Each stamp featured a young woman in national costume symbolizing the state clutching a sword and holding a large wreath encircling the legend ‘1918 18 nov. 1919. 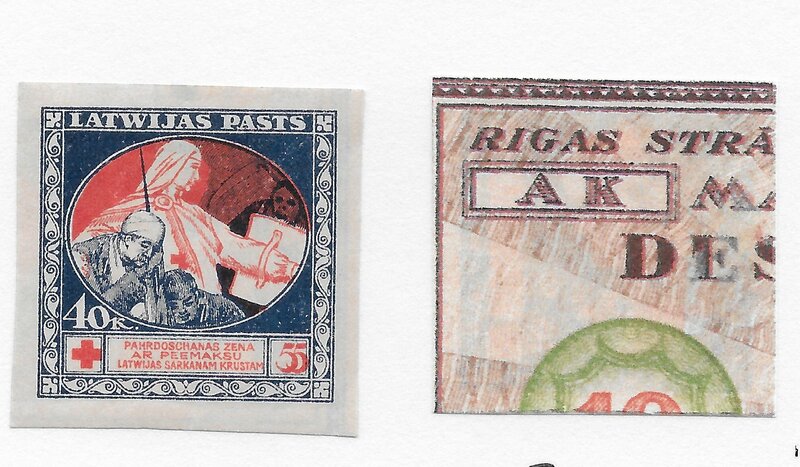 Shortages of paper, and probably wry propaganda, led the 1 rublis value being printed on banknotes being prepared, but never finished, by the embryonic Riga Soviet. Other equally striking issues marked the final campaign to secure independence. 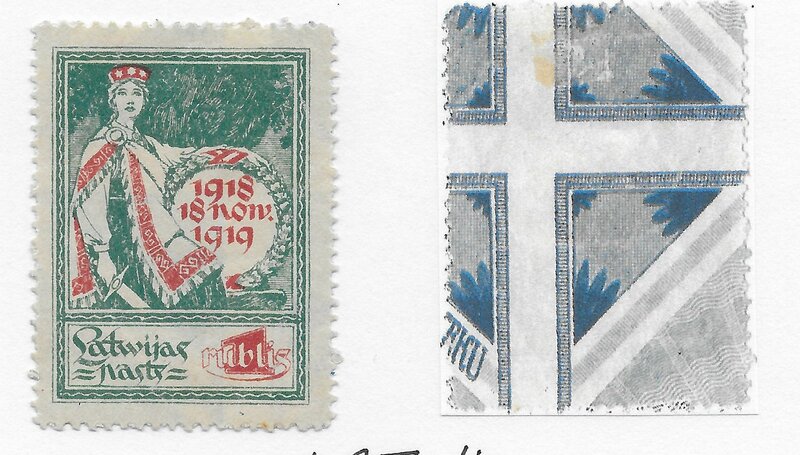 In December 1919 a colourful set featuring a dragon slayer commemorated the liberation of Courland. Bolshevik rule was driven back to Latgale in the east where it survived for several months before final dissolution after the Battle of Daugavpils in January 1920. Polish forces had joined with Latvian ones by this stage. The Poles were engaged in a life or death war with the Russian SFSR and they saw the Latvian front as part of their own struggle for survival. 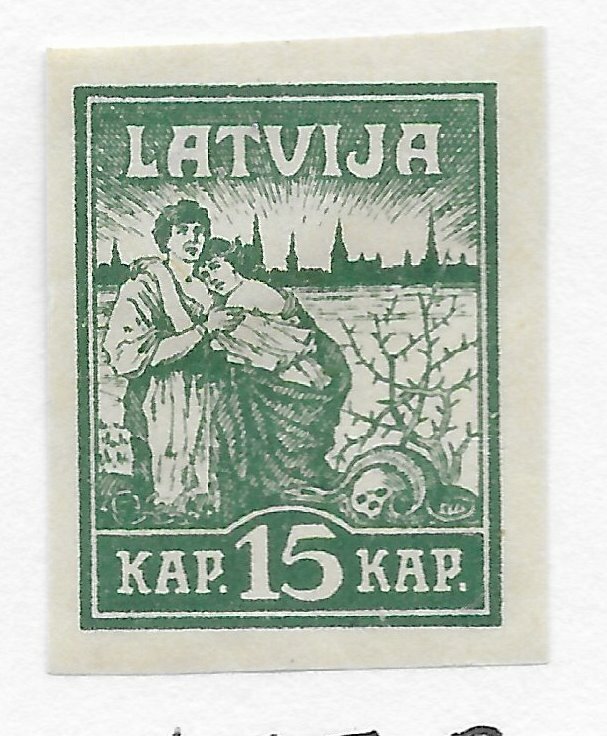 On 24 March 1920 the liberation of Latgale merited a pair of stamps featuring a mother welcoming a child home. It was printed on the back of banknotes over-optimistically prepared by the White West Russian Army. A few days later another celebratory set, this time with a young woman in national costume at the helm of a boat looking steadfastly ahead, marked the first meeting of the Constituent Assembly. The future might look more hopeful, but the casualties of war were ever-present. 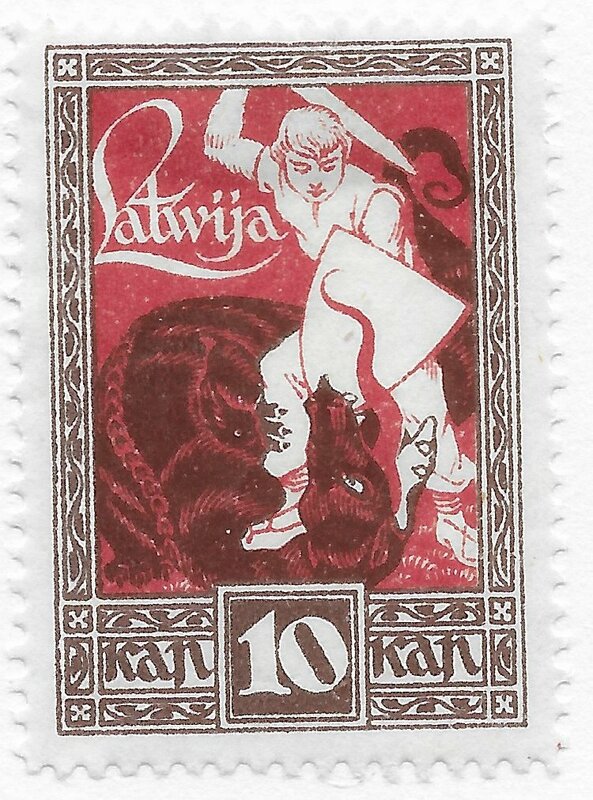 In early March 1920 four surcharged stamps picturing a woman symbolizing Latvia protecting a wounded soldier with a shield had been issued in support of the Red Cross. Three printings were undertaken, in March on Bolshevik blue banknotes, in May on green White Western Army ones, and in August on brown, green and red Riga Soviet ones. They were reissued again through the Red Cross in May 1921. On 11 August 1920 Soviet Russia signed a peace treaty with Latvia relinquishing all claims to its four provinces. It became a member of the League of Nations in September 1922. At home the great estates were broken up and granted to peasant farmers who in due course were to exert considerable political power. 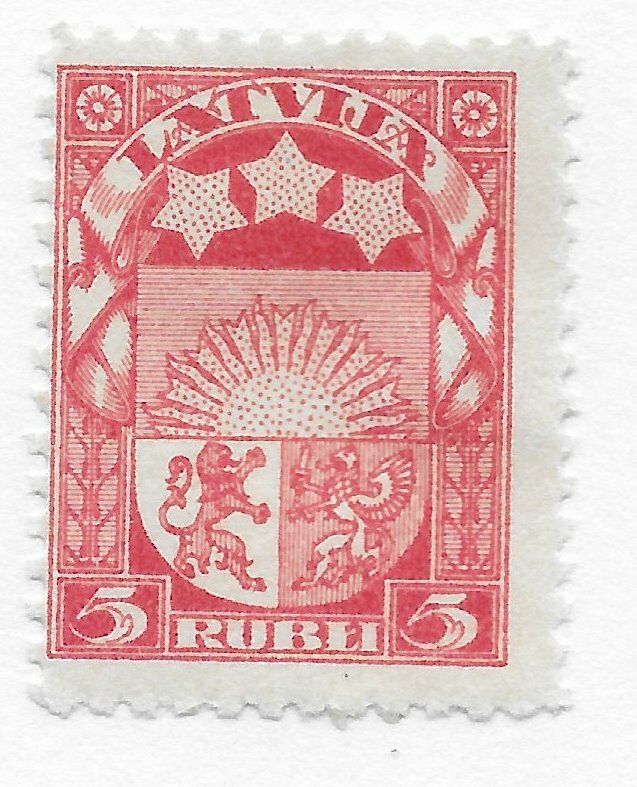 In 1921 the Latvian coat of arms with the rising sun of freedom above the red lion of Courland and silver griffin of Livonia adorned a new definitive set, and was repeated in a set in 1923 in the new currency of santinu and lats. The elaborate Great Seal of Latvia with its oak leaves and extra lion and griffin supporters made a rare public appearance on a set in 1923. 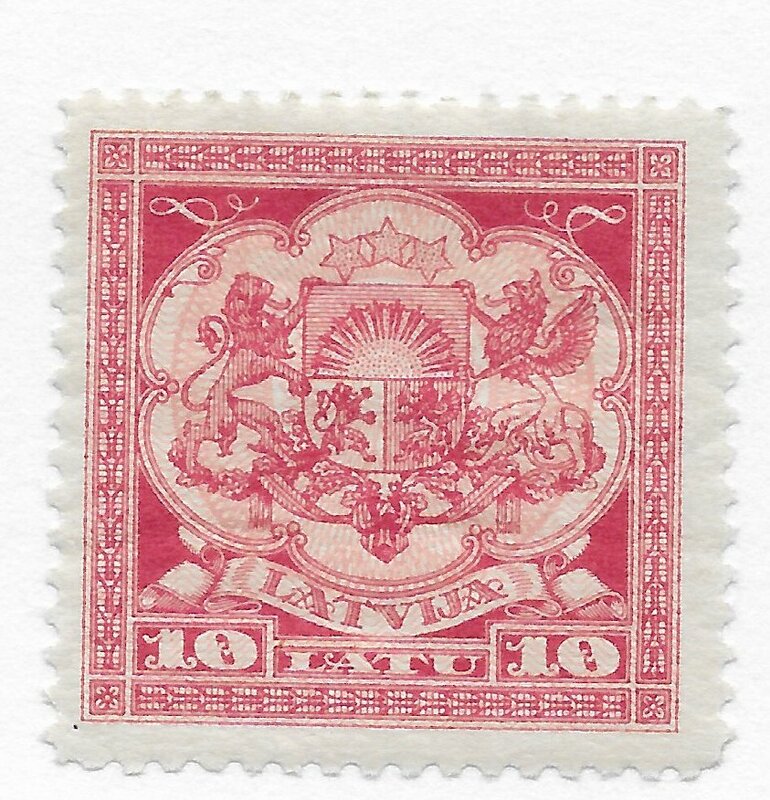 In that year, too, the lingering legacy of the brutal war of independence was remembered when the 1s, 2s and 4s arms stamps were offered overprinted with a Maltese Cross, a 10s surcharge and the legend KARA INVALIDIEM (FOR THE WAR INVALIDS). 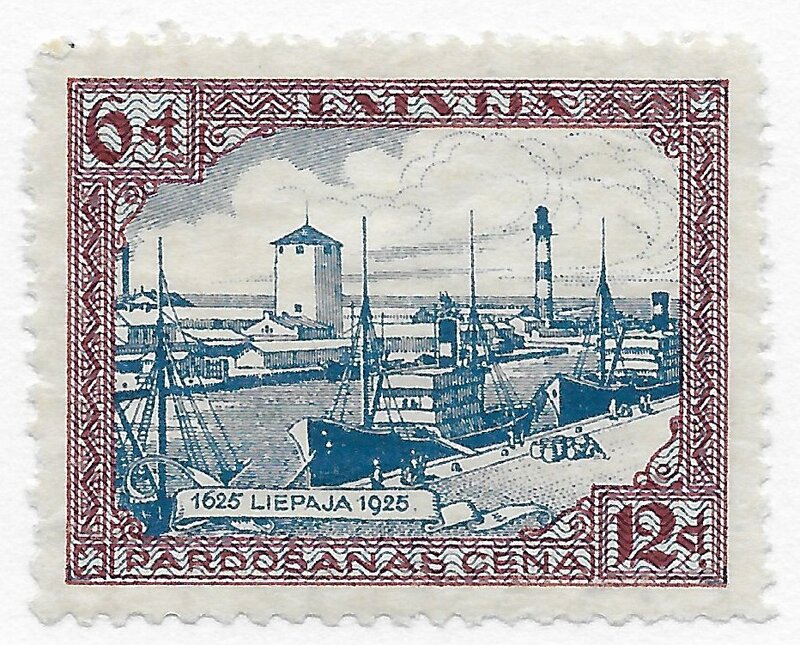 Stamp issues in the later 1920s avidly promoted Latvia’s history, culture, recent achievements, and unity sets embraced Liepeja’s tercentenary in 1925, and in 1928 marked the tenth anniversary of independence and supported the fund for a Liberty Memorial. However in 1928 Latvia had just over a decade of independence left before the Red Army returned in overwhelming force.